Firstly I would like to say a huge thank you to 'the team' (Rita, Rose and Di) for their help and support in keeping us up to date on Julian's work, and in running the forum and our associated facebook page. Another enormous thank you is also due to forum member Vicki for making the fantastic site banner. A big debt of gratitude is owed to Jools who originally established this great site and gave me the opportunity to inherit it from her. I am also grateful to all of the forum members and site visitors who keep me up to date with news of Julian and his work, donate towards the running costs and who make this such a lovely community to be a part of. And, of course, I would like to thank Julian for providing us with so much brilliant work to enjoy over the years. If I have used any of your work or property in this website, please contact me for credit or removal. 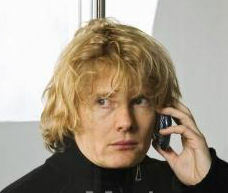 If you have any questions or comments about the site then you can email me at kim@julianrhind-tutt.co.uk. Please note that I am not associated with Julian or his agent. If you live in the UK and are hoping for a reply don't forget to include a properly stamped and self-addressed envelope with your letter. International visitors should go here for instructions relating to International Reply Coupons. This website is currently hosted on a fee-paying server. If you would like to help to support the running costs of the site, please use the link on the left. This button can also be used if you wish to donate to any of the occasional raffles or auctions we run for charity, or if you wish us to donate money to one of Julian's preferred charities on your behalf. Please tell me where you wish any money to be sent via email at kim@julianrhind-tutt.co.uk or using the payment details option on paypal.